This particularly hardy shrub is perfectly suited for a woodland garden or shrub border. 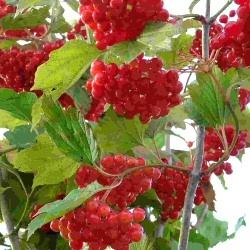 Of interest for most of the year because of its large, lacecap-like, white flowers from late spring to early summer, followed by bunches of small, bright red, fleshy fruit that attract wildlife into the garden. The dark green foliage that turns red in autumn. Expect a height of up to 4m.